Following the introduction of a levy on sugary soft drinks in the UK earlier this year, it has been reported that similar measures could potentially be introduced for chocolate and confectionery as soon as 2020. However, a tax on chocolate and confectionery might be less impactful at altering consumption habits than the government would hope, according to GlobalData, a leading data and analytics company. 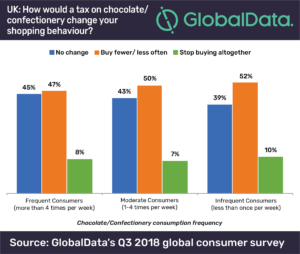 According to GlobalData’s Q3 2018 survey, 57% of UK consumers think they would buy fewer products, or stop buying them altogether, as result of a potential tax on confectionery or chocolate. While this does demonstrate that taxation may encourage many consumers to cut down, the figure is significantly lower than the 74% global average. In fact, of the 40 countries surveyed by GlobalData, only Japan and Denmark were less likely to be impacted by such a tax. Furthermore, those who consume chocolate or confectionery most frequently – arguably those who may need to curb their consumption the most – were found to be the least likely to consider changing their habits if taxes were imposed. Melanie Felgate, Senior Consumer Analyst at GlobalData commented, “Chocolate and confectionery, by its very nature, is an indulgence-led purchase. Those consuming it will likely be well aware of the sugar content and potential health implications, yet still choose to treat themselves. An influx of premium chocolate and confectionery launches in the UK, such as the Ruby KitKat, in recent years is evidence that higher prices are unlikely to stem consumption.